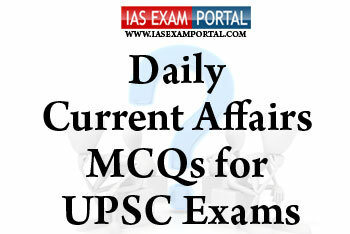 Current Affairs MCQ for UPSC Exams - 12 FEBRUARY 2019 | IAS EXAM PORTAL - India's Largest Community for UPSC Exam Aspirants. 1) The scheme for CHYLP envisaged enriching awareness of Indian culture and heritage amongst the youth in order to promote, understand and develop fondness for India’s rich cultural heritage, with a view to develop appropriate leadership qualities amongst youth. 2) The focus of the programme is to be on less privileged children residing in backward areas by interacting with them in vernacular languages for their better understanding. 3) The Museum Division of this Ministry arranges visits of children of unprivileged section of society to museums so that these children may get an opportunity to gain the knowledge relating to the Indian History and Culture and Science. 1) Though the Constitution of India does not define the word ‘Minority’ and only refers to ‘Minorities’ and speaks of those ‘based on religion or language’, the rights of the minorities have been spelt out in the Constitution in detail. 2) The social pluralism of India, as fortified by the unique Constitutional concept of secularism, raises the need for the protection and development of all sorts of weaker sections of the Indian citizenry whether this ‘weakness’ is based on numbers or on social, economic or educational status of any particular group. 3) The National Commission of Minorities (NCM) adheres to the United Nations Declaration of 1992 which states that "States shall protect the existence of the National or Ethnic, Cultural, Religious and Linguistic identity of minorities within their respective territories and encourage conditions for the promotion of that identity. Q4. Which of the following statements with respect to current global energy prospects are true ? 1) There has been a big shift in energy consumption from OECD countries to developing Asia. 2) China has become the world’s largest oil and gas producer after the shale revolution and is challenging the traditional oil dynamics. 3) Affordable Solar PV is taking increasing share in the supply mix, helping to reduce carbon footprints. Q5. Which of the following SAARC countries is referred to as a carbon negative country of the world ?